You will hear the corrective action, preventive action, and defect repair too frequently in project management world. Because during the project life cycle, requests, changes, and variances will happen. No matter how great you did in the develop project management plan process, it’s natural to have those. So you need to know how to respond to these. You will have to use corrective action, preventive action or defect repair. But how well do you know the definitions of corrective action, preventive action, and defect repair? Do you know how the corrective action procedure works? 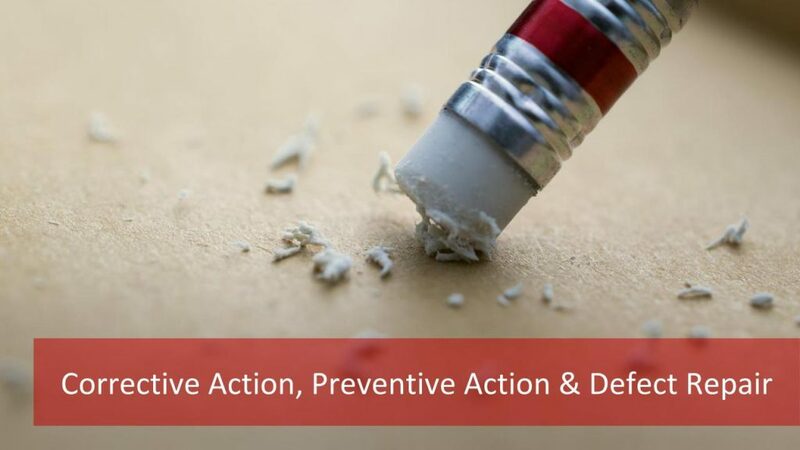 Are you aware how to implement preventive actions? Corrective action, preventive action, or defect repair can happen in the Direct and Manage Project Work process. In this article, we will give details and samples for corrective action and the other terms to illustrate these better in your mind. You may also consider taking a PMP training course for learning more about the concepts of corrective action and the other terms. Let’s begin by defining the corrective action. 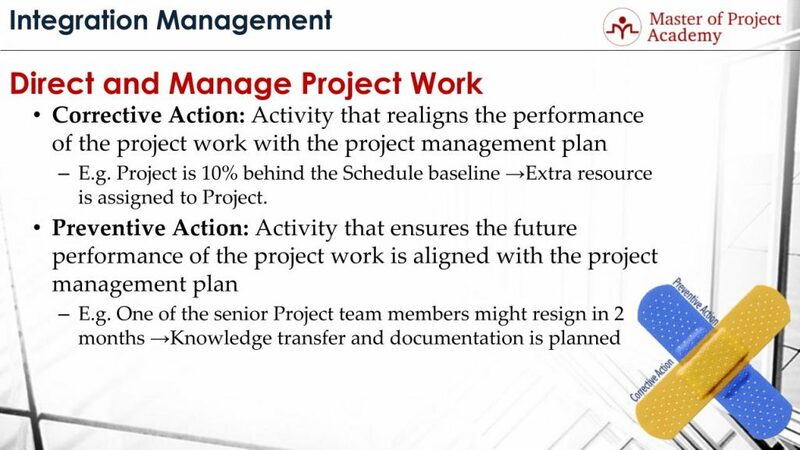 The corrective action is an activity that realigns the performance of the project work with the project management plan. No matter how perfect your project plan is, you will have variances in project execution. Actual results will differ from the planned values. We all know that there are project constraints in the project management world. The two most important constraints are time and budget. Ideally, you should complete the project within the approved schedule and budget. To meet the project objectives such as project budget and schedule, you need to take a corrective action accordingly. Otherwise, you cannot meet the objectives. For instance, let’s consider that you are managing a smartphone project. During project monitoring and control process, your performance results showed that project is 10% behind the planned schedule. In order to meet the project objectives, the project must be completed on time if there is not a new requirement coming from the customer or if there is not an approved change request. To meet the agreed schedule, there is only one way: Corrective action. Future tasks of the project must be completed faster than planned to finish the project on time. And to do this, you can request extra resources for the project and assign them to future activities to complete remaining scope in a shorter time. This is how you take a corrective action. Preventive Action is an activity that ensures the future performance of the project work is aligned with the project management plan. What differs the corrective action from preventive actions is, corrective action is taken based on happened actual results while the preventive action is taken for a future anticipated risk. For instance, let’s consider that one of the senior engineers in your project team might resign in two months and if he resigns, there will be a loss of know-how and handing over his tasks to a new engineer will take time. Naturally, this will affect the project schedule. As you see, this is a risk which did not happen yet. But a response strategy must exist to accommodate the impacts of this risk if it happens. Preventive action for this risk can be know-how transfer from this senior engineer to other project resources and also documenting the know-how of this engineer to not lose the critical competence of the project. Defect Repair is an activity to modify a nonconforming product or product component. Once a product or deliverable is complete, it must be checked whether it meets the requirements. If there are problems with the product or deliverable, these problems must be fixed by the project team before handing over to the customer. 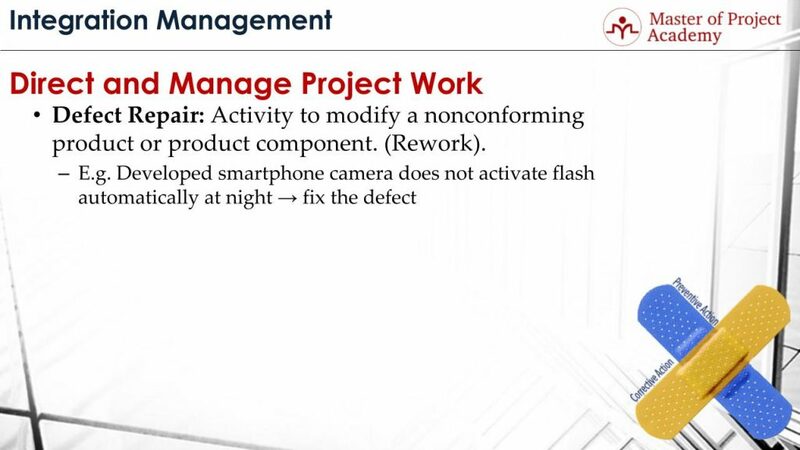 For instance, let’s consider that camera of the smartphone that is developed in the project does not activate flash automatically when taking photos at night. If this was a requirement determined in the beginning, this must be fixed. And this is called defect repair. So defect repair differs from the corrective action and preventive action, because it happens after the completion of a product or deliverable, not before. How the changes are approved in the project life cycle? Because change requests are submitted if there is a new requirement in the project, to correct the variances, prevent the impacts of any kinds of risks and fixing defects. We have seen the corrective action, preventive action and defect repair with their examples respectively. If you want to test your knowledge of these important terms, you may try to answer sample PMP exam questions.